A Dutch provider: Tweaknews is a Usenet service from the Netherlands. Its location is important: it answers to Dutch jurisdiction, not American. European Based servers are not subject to US DMCA laws. Tweaknews is a Tier-1 provider. They own their network (T1 USP) which means they have total control of their infrastructure. Tweaknews can provide Usenet content as fast as your internet connection can take it. Free Newsreader - UsenetWire newsreader allows you to to search, preview and download content. Tweaknews is a Dutch Usenet provider, known for its high download speeds. They also have one of the best completion rates in the industry. Tweaknews is a Netherlands-based Usenet provider. Based in the Netherlands helps to maximize completion rates. In Netherlands, Usenet providers are subject to NTD requests. Tweaknews binary retention is 2,500 days. The longer a post is stored, the higher the completion rate. 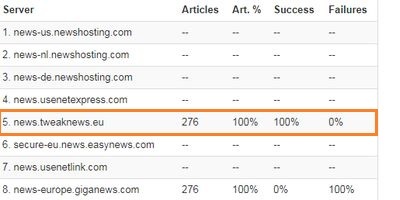 When it come to retention and completion, Tweaknews hosts files longer and better than the majority of European Usenet servers. Retention and completion go hand in hand. Speed is another thing to consider when choosing a Usenet Provider. Usenet is designed to support high-speed downloading. While most Dutch Usenet services cap speeds, Tweaknews provides speeds up to 1 GB/s!. We tested Tweaknews using a Fiber connection (Hyperoptic). We were really impressed by the speeds obtained with 30 connections. I was maxing out at 700 MB/s!. 50 GB should be downloaded in no more than 10 minutes. They offer the best speed of our tested European Usenet providers. TweakNews also offers five block packages (Their blocks have no time limit so you don’t have to worry about them expiring). With block packages you can maximize your completion rates. Newshosting offers a free newsreader with any Newshosting account. Newshosting client contains a very cool feature: "Backup NNTP". You can add a block account from Tweaknews to help you get downloads that Newshosting doesn't have for various reasons. I've tried Tweaknews block accounts and it's working perfectly so far with Newshosting unlimited account. This combo only gets you access to servers located in the EU. Generally, your best bet for completion are still the European providers. Usenet.Farm is under the NTD-behavioural code. Their price plans are based on your linespeed, so you never pay for stuff you don't need! ExtremeUsenet has 3 plans at a discounted price! These plans allow access to the server at 3 different timeslots. What’s more, all plans offered by ExtremeUsenet can be shared, reducing the price! XSNews is one of the last few independent European Usenet feeds. XSNews is a Tier-1 Provider based in Holland. XSNews offers both flat rate and block accounts, which means you have a number of options. This is an advantage because you can access the XSNews network as you want (Block or unlimited), and at modest prices. XSNews also offers all new members a 14 day free trial. You can download as much as you want at unlimited speed. Eweka: My first recommended European alternative to Tweaknews is Eweka. You get much higher retention rates. I have never had any problems with the downloads, completion rates is excellent. Usenet.Farm: Only 15 €/per payment for 500 GB (0.03 €/GB) and account sharing is allowed!